You may receive updates from Our Wisconsin Revolution, the sponsor of this petition. Robin Vos, WI State Assembly Speaker, and Scott Fitzgerald, WI State Senate Majority Leader. The people of Wisconsin have spoken and our representatives need to listen. In our 2018 mid-term election Wisconsinites voted to put one party - the democrats - in all in all 5 statewide offices (Governor, Lt. Governor, Secretary of State, State Treasurer and Attorney General). This is the first time since 1982 that one party will be seated in all five constitutional offices. With the election of a new Governor, Assembly Speaker Vos (R- Rochester) and Senate majority leader Fitzgerald (R- Juneau) are moving to limit the powers of our Governor-Elect, Tony Evers. This action is dangerous, odious, unfair and carries substantial consequences. We will be collecting petition signatures and hand delivering them to the offices of both Vos and Fitzgerald. 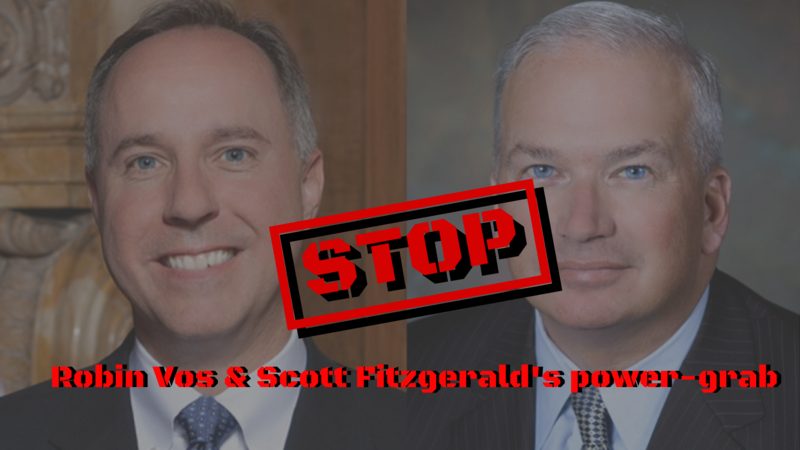 Sign the petition below and ask Representative Vos and Senator Fitzgerald to uphold the integrity of democracy and STOP their power grab against the Governor-Elect. To: Robin Vos, WI State Assembly Speaker, and Scott Fitzgerald, WI State Senate Majority Leader. Democratic elections are the foundation of a healthy democracy. We, the people of the state of Wisconsin, urge Speaker Vos and Senator Fitzgerald, to uphold the integrity of democracy in Wisconsin. Wisconsinites and their votes need to be fully respected. Throughout Wisconsin’s history, election results have been fully accepted by both major parties in the spirit of cooperation and for the good of the state. It is imperative that Wisconsin's legislature moves forward into 2019 in a bi-partisan way. Working together will make us stronger. Wisconsinites voted in Tony Evers, as a representative in Wisconsin, please respect that. NO special session, NO legislative action until our newly elected administration is seated.